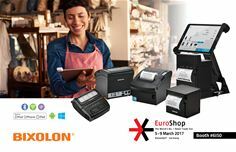 EuroShop 2017 (5-10 March 2017, Düsseldorf, Germany) – BIXOLON (stand 6I50), the global manufacturer of advanced Receipt, Label and Mobile Printers will be encouraging customers to explore BIXOLON’s product range and learn more about the latest mobile and mPOS printing solutions launching to the European market at EuroShop 2017. The SRP-Q300, BIXOLON’s first cube 3-inch thermal desktop printer, offers flexible mPOS receipt printing from Android™, iOS™ and Windows® mobile devices. Supporting dual-band WLAN (5 GHz and 2.4 GHz), Bluetooth V4.2 Classic & LE as an option, and a smart Wi-Fi setting via mobile devices is available. SRP-Q300 also supports a range of accessories— including LCD customer displays, card readers (MSR/SCR) and tablet stands. BIXOLON’s B-gate is a connectivity hub for mPOS solutions that seamlessly connects and charges the host tablet device (via Bluetooth or Wi-Fi wireless communication) while supporting up to 4 USB peripherals (scanner, cash drawer, customer display, RFID reader, scales, etc.). B-gate gives retailers the flexibility and scalability to design their own POS environment while supporting existing peripherals and smart mobile devices. By adding the optional B-gate hub to the Q300, the SRP-Q300 can power a wide range of POS accessories. Most notably, B-gate for Q300 supports printing from native, web-based, hybrid mPOS applications and cloud-based Online Order Printing. This remarkable feature transforms the SRP-Q300 into a complete mPOS solution with a smaller footprint and competitive pricing. The SPP-R410, BIXOLON’s latest-generation 4-inch mobile printer, is a full 25% lighter and 22% smaller than its predecessor, the SRP-R400. With both wireless and wired connectivity options, including Bluetooth, Wi-Fi, USB and Serial, this tiny workhorse is ideally suited for retail warehouse and on-the-go printing applications.